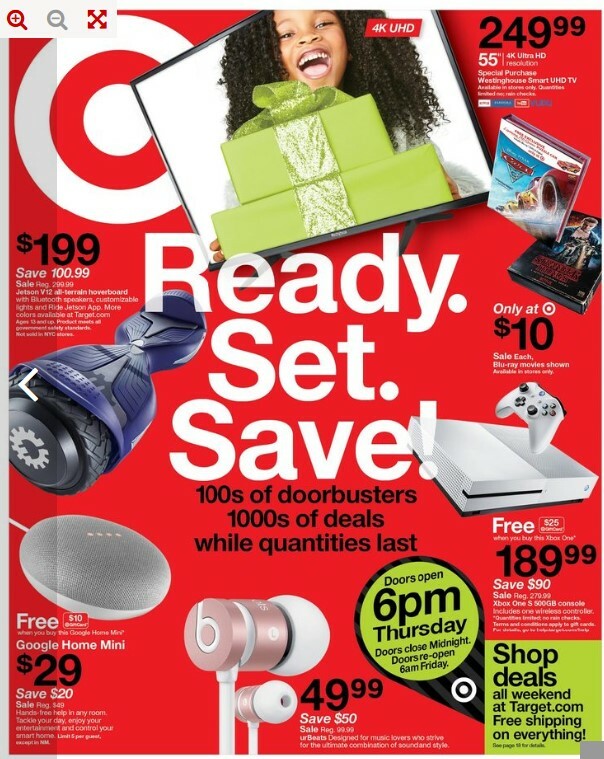 US Black Friday Cyber Monday Flyer Target US - Black Friday Sale Valid Thu Nov 23 – Sat Nov 25, 2017. 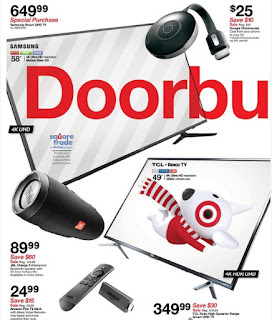 100s of doorbusters 1000s of deals while quantities last. 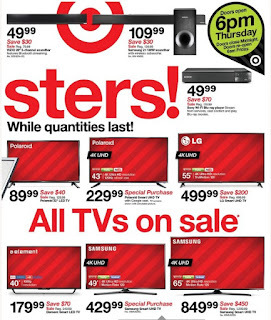 Special Purchase westinghouse smart UHD TV available in stores only. Quantities limited no rain checks 55" 4K Ultra HD Resolution - Price 249.99. Jetson V12 all-terrain hoverboard with Bluetooth speakers, customizable lights and ride jetson App. More colors available at target.com ages 13 and up. Product meets all govemment safety standards not sold in NYC storess. $1.99 save 100.99. Alson find Google home mini $29 save $20. UrBeats designed for music lovers who strive for the ultimate combination of sound and style - price $49.99 save $50. Xbox on S 500GB console includes on wireless controller free $25 giftcard when you buy this Xbox one - sale price $189.99 save $20. 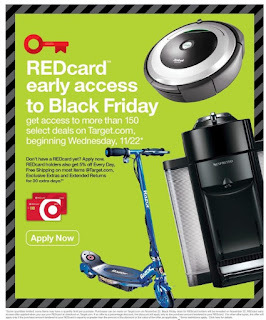 REDcard early access to Black Friday get access to more than 150 select deals on Target.com beginning wednesday 11/22. Don't have a RedCard yet? aplly now. 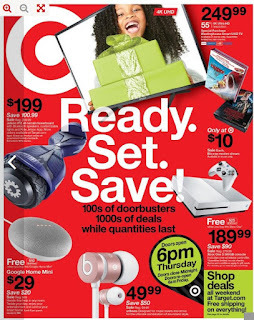 REDCard holders also get 5% off every day, free shipping on most items @Target.com exclusive Extras and Extended returns for 30 extra days. aply now. 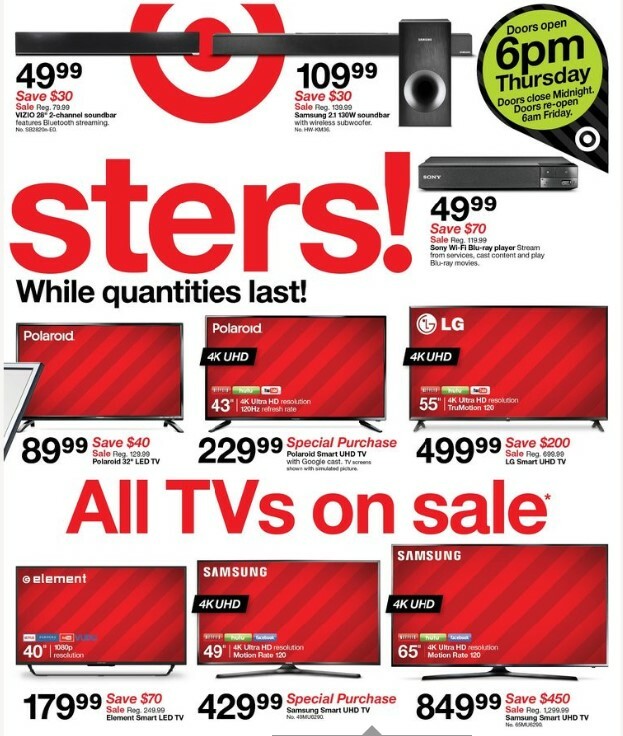 Special purchase samsung UHD TV $649.99, 58" 4K ultra HD resolution motion rate 120. Square trade an Allstate copany protect your purchase with a squaretrade protection plan. Google Chromecast cast from your phone to your TV only price $25 save $10. JBL Charger 3 waterproof bluetooth spkeaker with 20-hour battery life avaible in more olors only price $89.99 save $60. also find Amazon fire TV stick with alexa voice remote now faster and powerful than ever - $24.99 save $15.